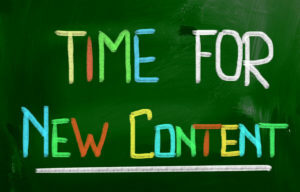 Time for New Content - AutoNetTV Media, Inc. When it comes to automotive Digital Menu Boards and Lobby TV programs, you’ve got choices. A lot of people focus on technical features and spend hours comparing specifications and capabilities. But you know what – your customers will never see the backend, assess the content asset management system, or appreciate the permissions hierarchy. For them: It’s all about the content, Baby! Content is what sets AutoNetTV apart from the other guys. Our price is competitive, our technology platform is absolutely top shelf; but our award-winning content is unrivaled. AutoNetTV invests heavily each month in expanding our content library. We back up our claim to the best content in the industry with a 4,500 sq. ft. production facility, seven full-time professionals, and an expansion team on call. 34 new pieces added for June 2016 – which brings total new assets to 279 for the year. Yeah, that’s how we show our commitment to remaining the leader in automotive digital content production and delivery. You probably want to know more. So click here.